of 2.3-million funded by the government. sanitation systems at the indaba. South Africa is now looking into alternative and innovative building materials to address backlogs in social housing delivery, and also to improve the quality of its products. The Department of Human Settlements hosted an indaba on 29 and 30 September in Sandton, Johannesburg, to explore new technologies that could be used for its building projects. The indaba, attended by leading business executives and research academics, was meant to find “new ideas” that are “concrete and implementable”, the department’s minister Tokyo Sexwale said. The department is addressing various faults in a number of social housing projects across the country. It has bulldozed shoddily built houses, spending billions of rands on rebuilding them. Demolishing started in the Eastern Cape in November 2009 where about 20 000 defective houses were flattened. The department also set aside R2-billion (US$287-million) to investigate “dodgy contractors” involved in corruption. As a result of inferior work, officials are forced to do comprehensive inspections on a number of ongoing projects, which is a waste of time, according to the director-general Thabane Zulu. “We should do things right from the start,” Zulu said, adding that there are extensive backlogs. The indaba saw more than 100 companies exhibiting innovative building technologies and new approaches to building. They included construction companies and developers in areas such as sanitation and solar energy. 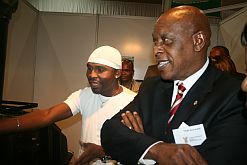 “We have to apply new technologies to build better homes,” Sexwale said. John Cook, MD of Nare Housing, brought his company’s steel and concrete wall surface, named the Blast Building System. Like many of the exhibited products, Cook’s new technology complements conventional bricks and mortar structures. Independent assessment company Agrément South Africa certified the product in June 2010, and Cook said they will start a project in the Eastern Cape in six weeks. It’s cheap and durable, and a house can be extended using bricks though it’s built of concrete and steel, according to Cook. Germany-based Surefire Group is planning to bid for subsidy housing contracts in South Africa through a local subsidiary. Surefire exhibited its double-insulated concrete structures. 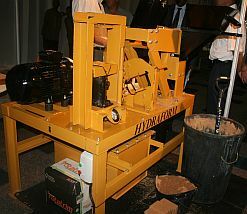 The indaba also focused on environment-friendly sanitation and electrification products. 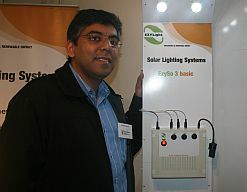 Cape Town-based Ezylight, a solar power company, introduced its lighting system, Featuring a solar panel, 12 volt battery and LED lights, the system costs R1 700 ($244) and lasts a lifetime, said founder Ahmed Ahmed. “Our focus for social housing is lighting,” he said. The market for solar energy in South Africa is still “very tight” and the indaba was a “move in the right direction by the government” towards promoting the technology, Ahmed said. Ezylight has been nominated for the 2010 eta Awards, which recognise excellence in innovation and use of efficient energy.